It is the highest grossing domestic film in China, easily surpassing Monster Hunt in a fracture of the time, without any sort of book-cooking game-playing. Therefore, it is probably safe to say demand for Stephen Chow slapstick lunacy is inexhaustibly rabid. Unfortunately, this one is a major disappointment. Brace yourself for the didacticism that drags down the manic spectacle of Chow’s The Mermaid (trailer here), starring Screen International Rising Star Asia Award Recipient Jelly Lin, which screens during the 2016 New York Asian Film Festival. Liu Xuan is a flashy real estate developer, who just pulled off a coup. He plans to soon reclaim a protected stretch of coastal property after chasing away the dolphins with a super-strong sonar installation. I bet you always thought dolphins used sonar themselves, but fortunately Chow is here to correct your zoological misperceptions. Turns out they can’t stand the stuff and neither can a secret colony of mermaids. As their numbers dwindle, the mega-cute Shan is recruited to assassinate Liu using poisonous sea urchins. However, Shan and Liu fall in love quicker than you can say Splash. Needless to say, this does not sit well with Ruolan, Liu’s on-again-off-again business partner and longtime flirting interest. She is also a major femme fatale, who is hatching a sinister plan of her own. Let’s face it, The Mermaid should be way more fun than it is. Unfortunately, Chow just loses control of his message (aren’t you supposed to use Western Union to send those? ), inflicting interminable scenes of Mermaids getting machine-gunned down (by primarily Anglo henchmen) on the audience. That’s right, there are a ton of dead mermaids in this film. Oh, such good times. At least he makes his environmental points with bludgeoning force. The film’s saving grace is Kitty Zhang Yuqi’s wonderfully sassy and seductive performance as the villainous Ruolan. You won’t think from appearances in films like CJ7 she had such cattiness in her, but that is how she supplies ninety-five percent of the fun to be found in The Mermaid. Jelly Lin is also quite soulful and vulnerable as Shan, which makes it even more disturbing to see legions of mermen getting slaughtered around her. 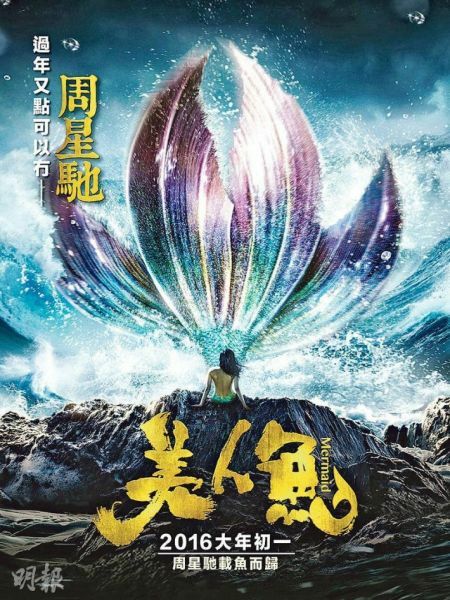 As for Deng Chao’s Liu, most viewers will want to stab him with a poisoned sea urchin after the first fifteen minutes. To an extent, Chow deserves credit for directly criticizing China’s environmental protection policies—or lack thereof to be more accurate. By just about every objective measure, the People’s Republic is the dirtiest nation in the history of pollution. (Check out Beijing Besieged by Waste sometime, on an empty stomach.) However, when he starts literally stacking up the body bags filled with mermaid carcasses, he sabotages the film for the sake of the message. Never in our wildest dreams did we ever imagine a Stephen Chow film could be described as a buzz-kill, but here we are. Not recommended—especially not for children because of the slaughtered mermaids—Chow’s The Mermaid screens this Saturday (7/2) with a special Q&A scheduled with breakthrough star Jelly Lin at the Walter Reade, as part of this year’s NYAFF.